After a few months in the developer and beta channels, Opera’s built-in VPN feature has finally graduated to the stable version of the desktop browser, allowing users to bypass geo-restrictions for online content and browse the web more securely by providing a secure, encrypted tunnel between your computer and a website or remote server. The new app is based on the SurfEasy VPN service acquired by Opera last year. It's free to use with unlimited data, no ads (for now) and 256-bit AES encryption. Opera claims that the VPN should be fast and reliable enough to stream video in 720p HD. To enable the new feature go to “Settings” (or “Preferences” on Mac), choose “Privacy & Security” and then toggle the free VPN. An icon labeled “VPN” will appear in the browser, from which you can toggle VPN on and off, and choose a location. One important caveat: while bypassing Netflix’s geoblocking technology is one of the most common uses for VPN services, The Next Web reports that the video streaming giant has already blocked the VPN from accessing its library. Bummer. Users are able to choose from five different server locations -- Canada, Germany, the Netherlands, Singapore and the US -- or let the Opera select the optimal server location based on factors such as network speed, latency, location and server capacity. 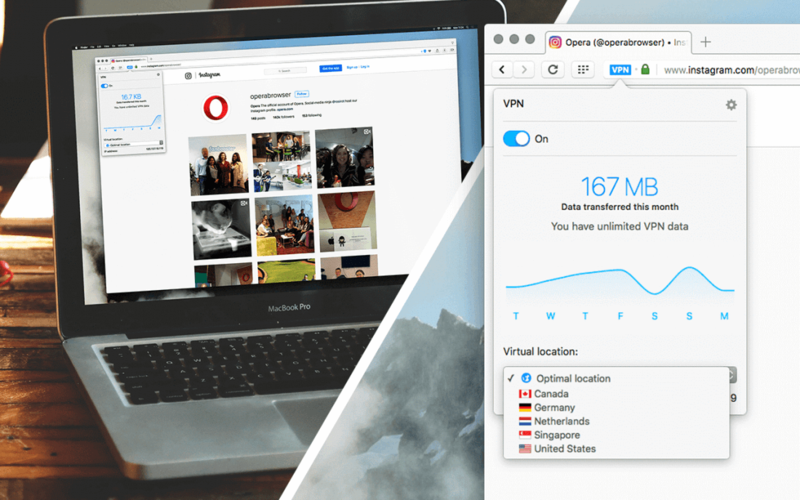 Opera has added some new VPN features since the initial developer release. You can choose whether to turn VPN on for everything, or only use it when browsing using private windows. Other new features as part of version 40 include automatic battery saving whenever your laptop is unplugged, Chromecast support, the browser’s video pop-out feature now supports more sites and players, RSS support and an updated browser engine. You can download Opera 40 here.